Are you thinking about getting a puppy or kitten for the holidays? A new puppy represents wonderment, innocence, unlimited energy, and unconditional love. But that puppy or kitten has needs, and will grow up, so let's find some puppy/kitten freebies! • Nulo Cat and Dog Food: Compare your food and receive $10 off in Nulo coupons and a free bandana. • Take the 28-Day Challenge: Make the switch to Purina ONE and you could see real differences in just 28 days. Simply answer a few questions to get a personalized food recommendation + $3 off Purina ONE. • BringFido free samples: From time to time, Bring Fido receives free samples of pet food, dog treats, and lots of other great stuff from their sponsors. Sign up for their email newsletter, and they will share Fido's favorites with you too! You'll also receive exclusive discounts on pet friendly hotels, tips on great places to bring Fido, and much more! • Pet Safety Pack: In the event of an emergency, their pet rescue window decal alerts rescue personnel that pets are inside your home. The safety pack also includes an ASPCA Animal Poison Control Center magnet — a great way to keep the APCC's toll-free emergency number and website address handy in case your pets get into something they shouldn't! • Friskies Coupons: Gravy goes crunchy! Save $1.00 on a bag of NEW Gravy Swirlers. Your cat will thank you later. • Muse Natural Cat Food: If your cat loves Muse Natural Cat Food, and you love earning FREE Muse goodies, you’ll LOVE the Muse Rewards Program! • Precious Cat Litter: Purchase a bag of Precious Cat Litter and send in the original cash register receipt, the product UPC, and this completed form to receive a rebate check for the cost of the purchase. • Dr. Elsey's Litter: They are so confident you and your cat will love Dr. Elsey's Litters, they are offering a rebate to new customers. • DiaGel Sample for Pets: DiaGel is an orally given gel that can be used in the event of diarrhea to quickly support proper bowel health in dogs and cats. Sign up for a free sample (note: sample sent directly to your clinic). • VETIQ Pet Care Products: Try out VETIQ Pet Care products for free in exchange for writing reviews online. 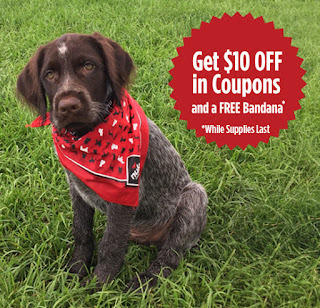 Spend More, Save More Coupon for collars, leashes, apparel, bowls and more! • Printable Coupons: Friskies, Cat Chow, and Bella.